© Reuters. 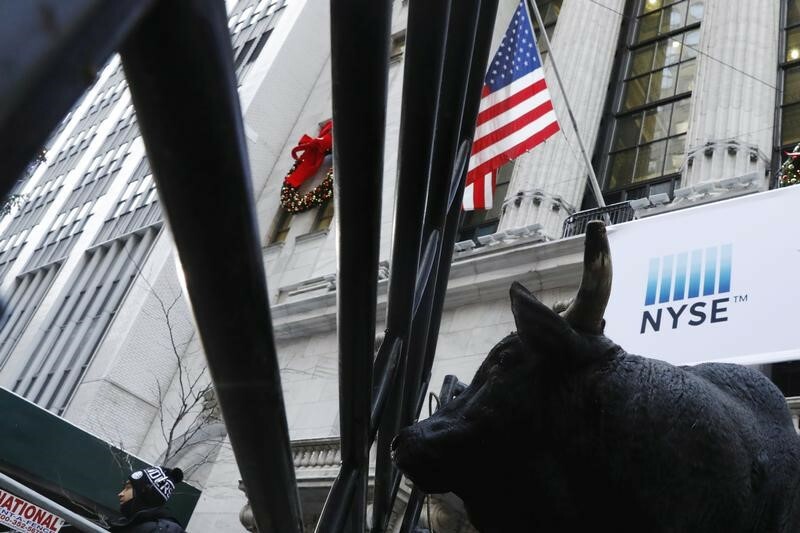 Wall Street inched forward on Wednesday. Investing.com – Wall Street moved up slightly on Wednesday as investors wait for news from the Fed’s monetary policy meeting. The S&P 500 was up two points or 0.07% to 2,788.88 as of 9:40 AM ET (13:40 GMT) while the Dow composite increased 31 points or 0.12% to 25,351.83 and tech heavy NASDAQ Composite rose over 12 points or 0.17% to 7,716.76. The Federal Reserve is expected to raise interest rates at 2:00 PM ET (18:00 GMT) as it ends it’s two-day monetary policy meeting. With the rate hike almost fully priced in, investors will closely pour over the Fed’s forecasts for interest rates, known as the “dot-plot” for signs of more interest rate hikes. The expectation of four rate hikes rather than three has increased amid rising inflation and a strengthening economy. Netflix (NASDAQ:NFLX) was among the top gainers after the morning bell, rising 1.33% after Goldman increased its price target while Time Warner Inc (NYSE:TWX) surged 3.60% after a judge ruled in favor of its merger with AT&T (NYSE:T), which was down 4.13%. Tesla (NASDAQ:TSLA) gained 0.29% while Twitter Inc (NYSE:TWTR) rose 0.90% and social media firm Snap Inc (NYSE:SNAP) was up 2.34%. Financial stocks were down, with H&R Block (NYSE:HRB) falling 19.00% after it said it expects its margins to shrink while HDFC Bank Limited ADR (NYSE:HDB) dipped 1.59%. In Europe stocks were mostly up. Germany’s DAX rose 44 points or 0.35% while in France the CAC 40 increased 10 points or 0.20% and in London, the FTSE 100 was up 25 points or 0.33%. Meanwhile the pan-European Euro Stoxx 50 gained seven points or 0.22% while Spain’s IBEX 35 fell nine or 0.10%. In commodities, gold futures rose 0.03% to $1,299.80 troy ounce while crude oil futures decreased 0.63% to $65.94 a barrel. The U.S. dollar index, which measures the greenback against a basket of six major currencies, slumped 0.13% to 93.70.